Peeling Oil Massage is a friendly and pleasant body care method. It moistens, softens, smoothes, lends the skin vitality and youthfulness as well as a velvety suppleness upon touch. During Peeling Massage, old, dry and hard dead cells are removed from the skin and the pores are cleansed using a special preparation with an abrasive effect. The soft massage agitates the microcirculation of the hypodermic system. The body is subsequently better oxygenated and detoxified. We accentuate the effects of Peeling Oil Massage by choice of peeling (scrub). At the Thai Fit studios, we offer quality peeling with a moistening prescription and 100% natural composition containing salt from the Dead Sea. 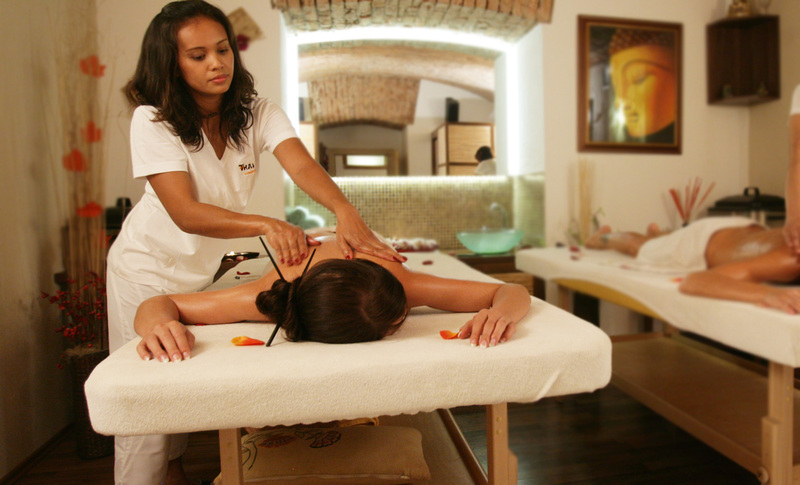 Peeling Massage apart from specific effects on the body also has an aroma therapeutic effect. Peeling Oil Massage is also pleasant relaxation, which releases accumulated negative energy, relaxes the body and mind, boosts optimism and evokes a pleasant feeling of lightness, purity and freshness. In Gold Peeling Oil Massage, we use peeling that contains 24 Carat Gold. Important worldwide aesthetic medicine research has proved the anti-ageing and oxygenating effects of Gold contained in cosmetics treatment preparations. The gold has a great influence on detoxification and regeneration of the epidermis. After its application, the skin is youngish, fresh, elastic and soft. In Slimming Peeling Oil Massage, we use special Anti Cellulite peeling. Thanks to its composition, this preparation significantly cleanses the pores, detoxifies and boosts excretion of excess fluids from the body. It efficiently acts against cellulite. Slimming Peeling Oil Massage leaves the skin soft and smooth at sight and touch. Visit us and personally try-out Peeling Oil Massage and experience the exquisite feeling of lightness, freshness and relaxation in the pleasant environment of the Thai Fit studios.